First time blogging about my experience with LAZADA. Guess what they are having Fashion Big Brand Sale in Lazada website now. Although I am not a branded stuff girl, but getting a brand that is authentic from the website is very important to me. I once have a bad experience buying branded item online. Once I received the product and I found out that the product is not authentic. I was kinda angry and frustrated at the same time. But it stated not refundable so I can only complain this issues to their customer service. It was a total disaster, I wasted almost 300 MYR to get the so-called branded item that I bought from online. From this experience onwards, I am quite afraid to get and branded item online now. 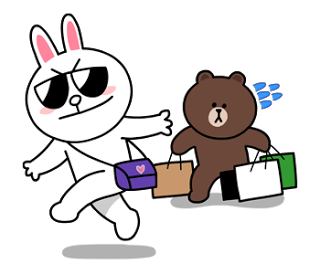 But recently I just know that in LAZADA, they are selling authentic product from few famous brand such as Puma, Nike, Carlo Rino, XIXILI, even Daniel Wellington too! This is because LAZADA deals directly with the brands principal. Not only that, LAZADA has been given exclusive prices by the brand principle, therefore, the price on the site is lower than elsewhere. With this Big Brand Sale start from 5th of September till 11th of September, you can even get up to 85% OFF item from few of the brand I mention above. This time, I manage to get this Puma Classic Suede from LAZADA. Which the quality totally out of my expectation. I never own a Puma Sneakers before so was very excited when I got my first ever Puma Sneakers. 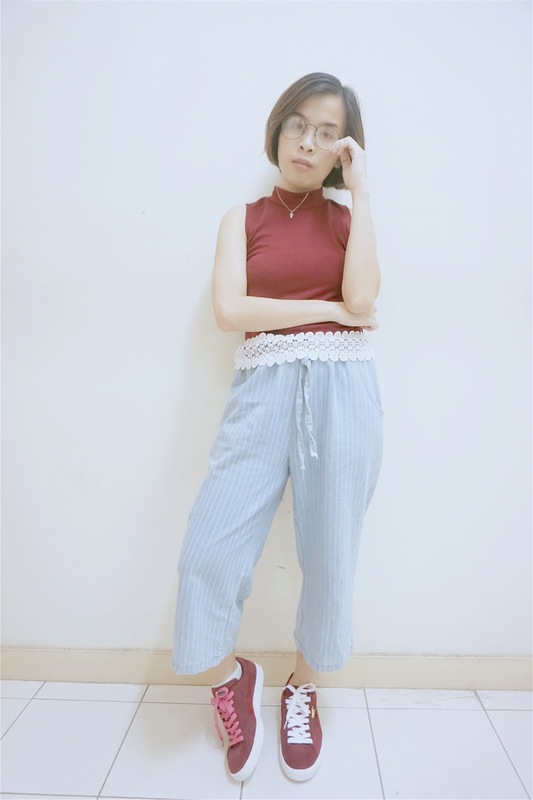 Just manage to shoot a few outfit photo with my new sneakers at home. The red color is such an outstanding color which I never really tried before. 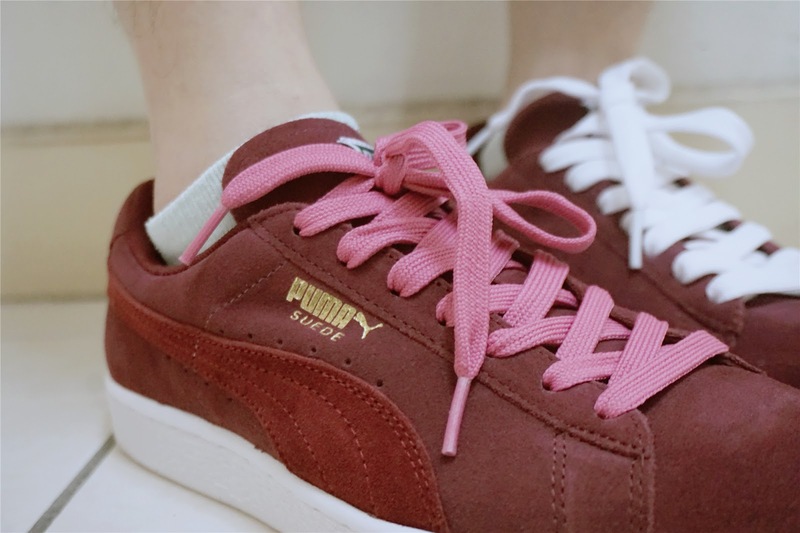 Now with this new red maroon Puma Suede Classic sneakers, I can always wear out and style it with my outfit. 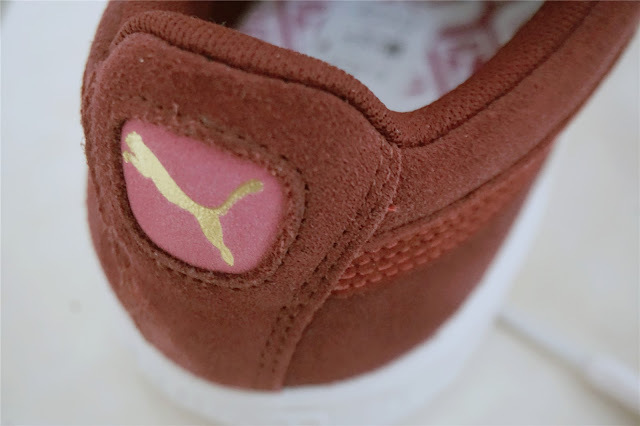 Close details of my Puma sneaker. I got two colors of the shoelace, one is pink and another one is white. In case you are bored with a white shoelace, you can always mix and match the color shoelace to create your own style. Behind and Side design of the Sneaker. The sewing patches are really detail and neat. Love the gold color printed logo on the sneaker too! The size of the shoes. Made in Indonesia. I believe this is where we always check whenever we buy any authentic branded item online. I am glad that this Puma Sneaker turns out to be authentic and loving its comfy design too! The cutting and the design of the sneaker is so comfortable to wear. Comes with cushioned insole for more comfort for your leg too! 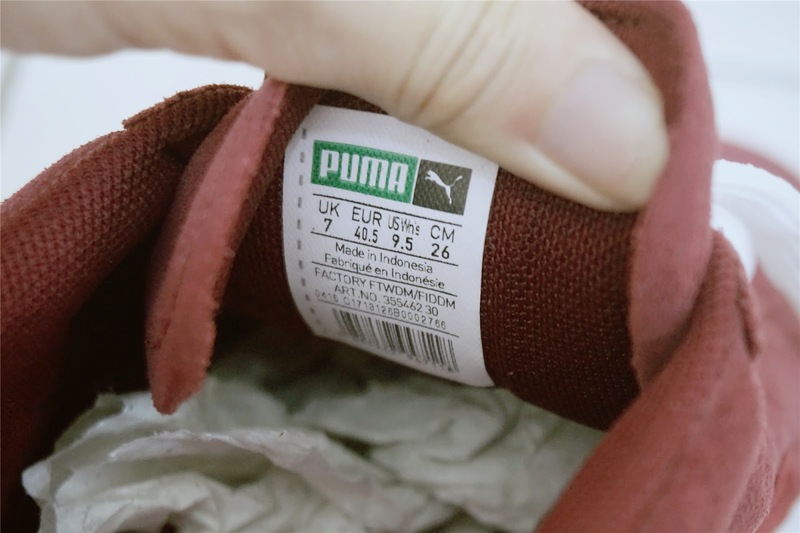 You can found PUMA logo on the front and side of the sneaker. You see I am really happy and satisfied with my Puma Sneaker from LAZADA. I am glad that I can find authentic brand through LAZADA and there will be no hassle for me to buy any authentic item from online anymore. If you wish to get all your favorite branded item in LAZADA that can up to 85% DISCOUNT OFF, click the banner below or link here to shop now for 20% OFF at LAZADA website. Until 11th September 2016 only! I agree =) I always have this issues too! Wow pretty shoe with the pink lace is so cute. Lazada Big Brand Sale !! Your sneaker shoe so striking and I like it. Will grab it on Lazada. Thanks babe for your love! The shoes look too large on you. Anyway, I'm gonna see if they have anything I like. Do check it out ya Emily! These shoes look really comfy! i've personally bought lots of stuff from lazada before.. not clothes though, watches, tech gadgets , and even fitness supplements. OMG I missed it :( too bad. Glad that you're just in time to grab something. awwwwhhh nevermind up coming there have a lot of sales coming up at Lazada! I like to buy from Lazada too. The shoes look nice on you. Hi Sherry you definitely need to check it out! The shoes look comfortable. Red is a nice color. I also love to buy PUMA products for my sport attire. Love their design. aiks missed the sales. will definitely check out for the next one. you look very cute in the outfit and shoes! Year End Sales will be so crazy then!! Wah sooo stylo babe ! Love that PUMA shoes ! And you look cute too ! Go go go XD Don't say I didn't warn you! Let's wait for more sales then! !